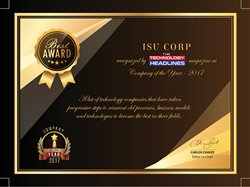 ISU Corp, a leading software development firm, has been named "Company of the Year 2017" by The Technology Headlines. We want to make the world a better place through custom software solutions and innovations. Our goal for the future is to keep providing top notch services, keep growing the company, but also give back to the community. “We want to make the world a better place through custom software solutions and innovations. Our goal for the future is to keep providing top notch services, keep growing the company, but also give back to the community.” - David Mansilla, ISU Corp CEO.